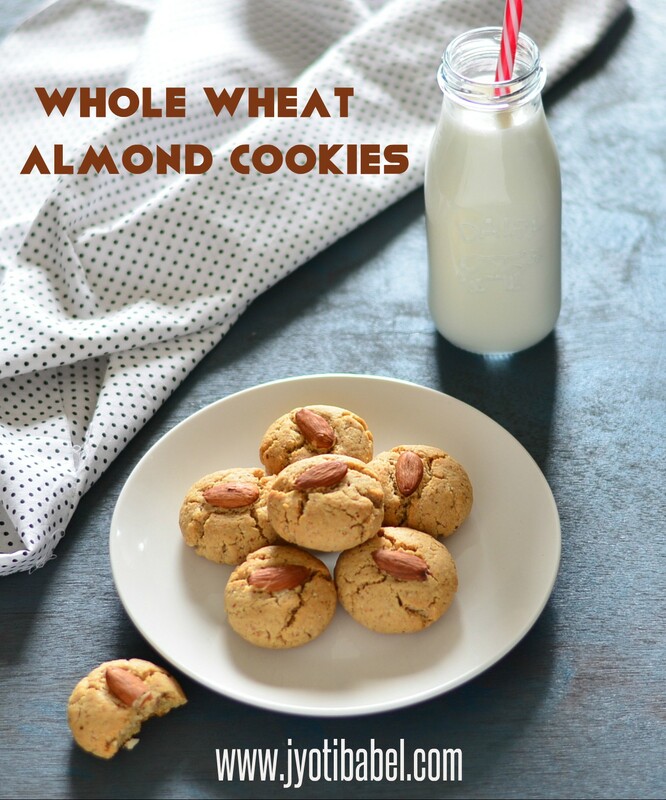 These eggless whole wheat almond cookies come with the goodness of almonds and whole wheat. 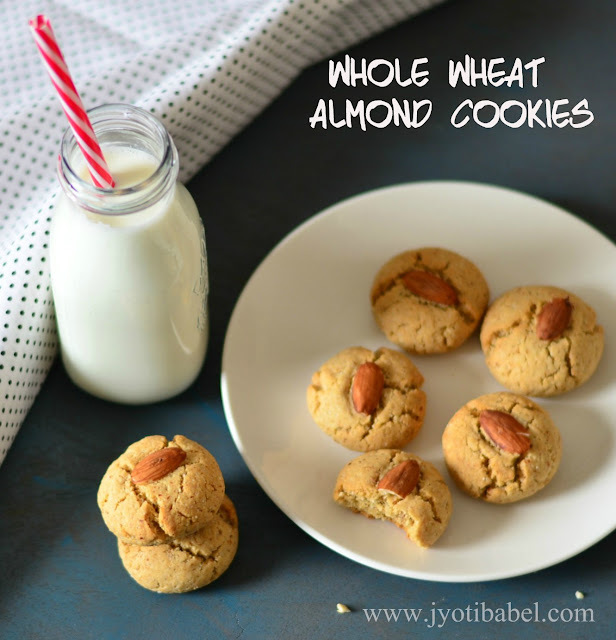 So, shun the store bought refined flour cookies and enjoy these with a glass of milk. Some time back, one of my fellow bloggers - Jolly, suggested that we try alphabet themed blog hop event and I was so excited about the whole idea. But, give it to my planning and execution, I am here with my blog post for the themed event on the very last day! Initially, I thought I would try something with apples. I had a couple of ideas - apple pie, apple crumble pie or applesauce brownies. But, none of those worked. And today, on the very final day for posting the recipe, this idea of almond cookies lit up in my head. I just went into the kitchen, gathered all the ingredients and bingo - the cookies were done, photographed in good time. This eggless whole wheat almond cookie recipe is my entry for the letter A - almonds being a vital ingredient in the recipe. 1. In a large bowl add flour, baking soda, salt and powdered almonds. Mix it well to make the mixture uniform. 2. In another bowl, add the butter and powdered sugar and whisk it well such that it is well incorporated. Add this to the flour mixture and using your hands bring the cookie dough together. 3. Add milk 1 tablespoon at a time, as needed, to form a smooth cookie dough. 4. Divide the cookie dough into 12 to 15 equal sized balls. Press it gently and place the slit almond over it. Repeat the same with all the dough balls. 5. Line a cookie tray with parchment paper. Preheat the oven to 180 C. Place all the dough balls in the tray. Keep a little distance between each of the dough balls as they will expand a little while baking. 6. Bake them in a preheated oven at 180 C for 20 to 25 minutes. When done they should be light golden in colour. They will feel soft while still warm and once cooled, they will be nice and with a little crunch. 7. Once they are completely cooled, store them in an airtight container and enjoy with milk, tea or coffee. Cookies are my weakness and these look so good. Now to make some to dunk in milk. Worth trying! Goodness of whole wheat is irresistible. Those cookies looks just prefect to munch without any fuss, excellent kid's friendly snacks to pack in their snack box. It looks super delicious almond cookies. Love the way you have well explained the recipe. I will definitely give it a try. Perfect cookies Jyoti!I made a gluten and dairy free recipe with a Cherry on top!Yours look so inviting and perfect with a cup of tea! The cookies look absolutely delicious, great use of the ingredient and this would be perfect with a piping hot mug of coffee. Cookies are always must in our tea time...these cookies looks perfect for it..and I loved the fact you used whole wheat flour in it.. These cookies look so delicious. Using wholewheat and loaded with protein rich almonds..yummy. Lovely cookies, they look so melt in the mouth. Nice share.